It is from my airplane seat that I am able to see the devastation, which hurricane Sandy caused along the shorelines of New Jersey as I am flying back home from a symposium at Princeton University; the symposium was held to honor Peter Eisenman’s longstanding relationship with the university on the occasion of his eightieth birthday. How topical this event turned out to be! 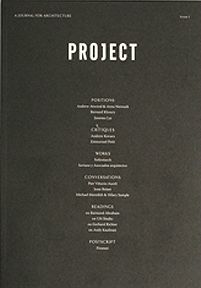 Did not Eisenman publish a book entitled “The Architecture of the Disaster” (2009) in reference to Maurice Blanchot’s deeply poetical and paradoxical “The Writing of the Disaster” (1980) – two books in which the authors argued that aesthetic form can only be fragmentary, incomplete, and aphoristic in the face of the disaster’s impending threat ... that the poetics of aesthetic form subverts the notions of clarity, synthesis, and presence? The coincidence of the Hurricane from two weeks ago and the Princeton occasion (on the topic of “Resistance and the Discipline of Architecture”) triggers a whole series of complex questions about the dialectic relationship between the “real” and the “intellectual”; it is as if two versions of the sublime had crossed paths – one unwanted and “natural,” and one “cultural” (i.e. man-made by the architectural intelligentsia). Fragmentary form appears to be the outcome of both: only in one case we think of it as “allegorical” and “textual,” while in the other, it turns into mere rubble and debris. Now, add the political debates of the past few months and last week’s presidential election into the mix, and you have lots of food for thought on the paradoxical condition of modern man (torn between the desert of the real and the sophistications of intellectual and rhetorical finesse). After the Republican candidate Mitt Romney had ridiculed President Obama for all his talk about saving the planet and caring about the rise of the sea water level instead of concern about the “priority” of the economy, the monster storm made the United States aware, once again after Katrina had ravaged New Orleans, of the vulnerability of its cities. The Southern part of Manhattan was without electric power or a subway for a week, and offered a sight of the City that was eerier than even after the terrorist attacks on the World Trade Center in September 2001. The effect is properly called the “sublime,” which, if we believe Edmund Burke’s definition from his Philosophical Enquiry into the Origin of our Ideas of the Sublime and Beautiful from 1757, creates emotions of terror which are “much more powerful than those which enter on the part of pleasure.” New York City looked as sublime as never before, and only the right amount of physical and emotional distance could make the sight transfixing for a moment. in Shanghai, the complexity of the vertical forms and zoning (as if several cities were stacked on top of one another at variable scales) seems to transcends any of the previous theories of urban architecture; the latter’s horizontalism (even when extruded in 3D) needs to be updated with a theory of the volumetric. I propose that one can begin to extract such a theory from Sloterdijk’s psycho-philosophical hypotheses. As such, both “modern” and “postmodern” cities shared the notion that the boundaries between interiors and exteriors (and consequently, the traditional urban ‘object’) had to be erased. The modern city praised itself for not producing interior spaces; Sigfried Giedion, for example, saw in the structures of the Eiffel Tower or the Pont Transbordeur in Marseille the epitome of modern spatiality for their open steel truss architecture which did not enclose individual spaces. The modern city largely transcended individuality in that it was conceptualized as a place that organized the functions of the collective in a homogeneous, Cartesian space (often based on the grid). And the postmodern dealt with the grid in more fragmented and labyrinthian ways than early century modernism; yet here too, the oppositional structure of inside versus outside has been canceled out, and subsumed under the seamless continuities of spatial and urban “texts” – as suggested, for example, in the urban poché that connected the disparate formal islands in the argument of Collage City. Leaving behind the idea of a unified understanding of the “humanist House” – usually symbolized architecturally by the Dome, Sloterdijk recuperates the possibility of psycho-philosophical interiors for human beings. While in Heidegger there existed only one “horizon of Being” (i.e. the authentic temporality of Being from which humans are cut off in the metropolis), Sloterdijk argues for the paradoxical possibility of a cohabitation of isolated spheres, each of which can aspire to its own set of ontological horizons and thus exist in “co-isolation” (as exemplified by the stacked object architecture of the Shanghai skyline). In other words, the urbanity of Being in Sloterdijk hinges on the plurality of individual aspirations – each of which inhabiting its own sphere in the semi-dense aggregation of a volumetric and spatial “foam.” Against Heidegger, Sloterdijk concedes that each individual can have multiple avatar-identities instead of only one (authentic) selfhood. One imagines that the field-condition of the contemporary city can reflect the multiplication of identities and act as a matrix within which many different spheres of subjectivity can be nested and volumetrically superimposed. We live in the “era of choice worldviews and identities” (im Zeitalter der Wahlweltbilder und Wahlselbstbilder), Sloterdijk declares in Sphären III, and points to the contemporary tendency of lifeforms to strongly individualize and to avoid conforming to particular types. On one level, this plural worldview resonates well with one of the most influential theories of architecture and urbanism in the past decades: Rem Koolhaas’s and Madelon Vriesendorp’s “City of the Captive Globe” from the early 1970s. Composed of a multitude of different ego-spheres (in Sloterdijk’s terminology Ich-Sphären), Koolhaas’s liberalist utopia allows for the peaceful adjacency of completely unrelated ideologies. It is well known that this concept stood for the urban architecture of Manhattan, and it is key to understand the role of the Manhattan grid as an organizing device: because of it pragmatic indifference to what it unites or divides, the grid is able to act as an ideologically neutral and ”democratic” urban contract. 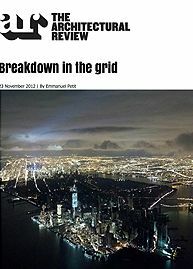 As such, the grid analogizes the abstractness of a currency: it is in the service of “circulation” (the circulation of urban traffic like the circulation of money), and in order to fill this role efficiently, it is drained of any ethical content besides the ideology of expansion and inclusion itself: just like everything has a price, everything can also find a place in the pragmatic “city of indifference” – had not Jean Baudrillard elevated the notion of “indifference” to one of the key characteristics of postmodern ideology (and irony)?! Koolhaas divided his liberal city into its “two” dimensionalities: while the expansive geometry of the grid structured the common, horizontal territory of the city, the vertical was given over to the demands of individual freedom; as such, the city’s verticality was not theorizable beyond the notion of freedom (and hence, it was strictly reserved to the domain of subjective expression). The third dimension of Koolhaas’s city further confirmed Michel Foucault’s suggestion that the vertical is not simply one of the dimensions of space, but that it is the dimension of power; if everybody can seamlessly find a place in the grid, then only the vertical dimension can be used to express “difference.” Structurally, Koolhaas’s theory of the city, his Manhattanism, in many ways illustrated the spatiality of American (pragmatic) democracy of the 20th century. Sure enough, Sloterdijk is less charmed by pragmatic and liberalist philosophy than Koolhaas has been up to the present, and hence Sloterdijk’s notion of “spheres” does not support the idea of ideologically neutral buffer zones separating diverse ideologies (e.g. the street space in the “City of the Captive Globe”).